The first 2 days were fine because I had my assignments to keep me busy (I hate the Nursing-student life). But the last 2 days were agonizing! The boredom just drives me crazy! I thought that I should just study to spend some time but then my laptop obsession turned up and I was so excited and frustrated because the future of my laptop is so dim. I hate it when my expectations aren't met. 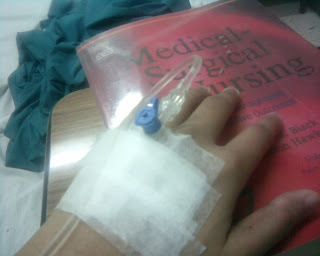 Anyway, this is my second time to be admitted in the hospital. I couldn't remember my first time because I was so young back then but I remember every moment in the hospital right now. My admitting doctor was very nice and it's all thanks to her excellent clinical eye and medical management that I was feeling better on the second day already. I had fever up to 40 degrees Celcius and I was suffering from chills due to my super inflamed tonsils that had already started to have pus. It's not a good picture people. I'm very prone to tonsillitis, pharyngitis, and all mouth diseases so I tend to stay from dirty foods but why do I still get tonsillitis?! It really feels nice when I'm injected with my antibiotics through my IV line, it feels so cool. I just hate it thought when people comes into my room every four hours even in the crack of dawn but my nurses and even wardmen are very nice. I also like my room, i really felt that I was in a hotel and I'll just ring the bell if I wanted anything. My bathroom was also clean so I really didn't have any complain about it. I have been discharged now and I feel like a million dollar (wonder why I used this cliche). Good thing too that I stayed at a company owned hospital because oh my, the bill was very expensive. As the saying goes, "Mahirap magkasakit". Translation: Don't ever get sick because you'll just get worst when you see the bill.